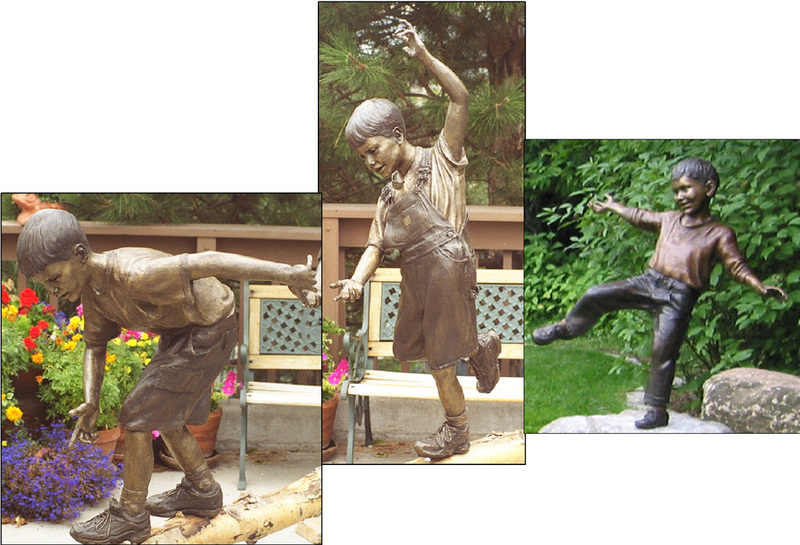 The 2-piece "Balancing Act" sculpture was inspired by Dan's two grandsons and a group of neighborhood friends frolicking on the fallen limbs of a wind blown cottonwood tree. The "Gravity Master" bronze sculpture was added a few years later as an extension to the "Balancing Act" composition. "Gravity Master" captures a young boy defying gravity to keep up with his older brothers. These three balancing boys can be displayed in a wide variety of settings. They work nicely installed on a natural or bronze log, large boulders, or an existing ledge or wall. "Balancing Act" is permanently installed in Caldwell Park, Redding, California; the Carnegie Arts Center, Alliance, Nebraska; and the Londen Center, Scottsdale, Arizona.